This bizarre-looking contraption was too good to pass up for an I Tried It post. So of course we sent a writer to give it a whirl. By Courtenay Devlin·	 8/2/2012, 12:26 p.m. The Jacobs Ladder workout machine first made an appearance in my life when it mysteriously showed up in my university gym at the end of spring semester. When I saw it looming across the workout floor, I admit I was a little skeptical. It’s a huge, hulking black object that sort of juts upwards instead of staying nicely rested on the ground like your standard gym-issued treadmill, elliptical, or stationary bike. To add to the mystique, I noticed the brave folks who did attempt to try it out had to actually strap themselves to the machine using a belted harness (was this a torture device?!). Naturally, when the intrepid user finally maneuvered himself up onto the rungs, all eyes in the gym were on that poor, brave soul. It was right then and there when I decided the Jacobs Ladder was not for me. Fast forward two months: There’s an email from Emily in my inbox. Recipients: Becky and me, the current Be Well team. Message: “One of us should do an ‘I tried it’ on this contraption. Let me know if either of you are interested!” I waited. No reply from Becky. I thought about it. I did some research. 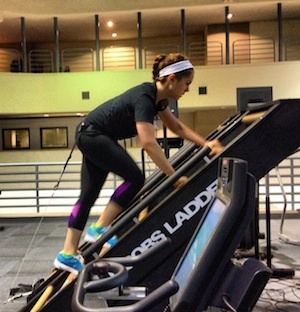 The Jacobs Ladder website calls the contraption an “elevated treadmill climber.” Imagine a treadmill raised at a 40-degree angle, and with rungs instead of a rubber belt. It is also self-powered. There’s no electricity needed so it’s basically a human hamster wheel: the faster you climb the faster it goes. I read Yoga Peach’s shockingly positive review of her experience on the Sporting Club at the Bellevue’s Ladder (she spent 21 minutes on it!). That, and the off chance that I could possibly spot Miley Cyrus (or even better, Liam Hemsworth) at the Sporting Club, led me to say yes. So I went for it. Hannah Purbe, fitness director at the club, was nice enough to set aside some time to show me the ropes. As I walked onto the fitness room floor, fully primed to climb for 30 minutes, Hannah said, “I usually don’t recommend that clients spend long stretches of time on this machine because it can put too much stress on your back if you don’t engage your core the entire time.” Bummer. Hannah strapped the belt on me and I got on the Ladder to see what all the hype was about. Thankfully, there were not too many stares from onlookers. I suppose this is because the club has had their two Ladders for about two years now, so members are used to them. The Ladder workout requires some serious coordination and rhythm, skills I usually have when I am standing straight up but didn’t come as easily when I was on the machine. It took a minute to get the hang of it, but soon I was climbing away on the machine at the pace Hannah tells her clients to get to: 80 feet per minute. I spent three minutes climbing before heading over to the weights to get in a good circuit of arms and legs; then it was back to the Ladder. Since the Ladder intensely works both the arm and leg muscles, and the climber can move as fast as he or she wants, the experience is comparable to doing bear crawls or mountain climbers for three minutes—moves often seen in a circuit workout. I came into the gym with the impression that the Ladder would be more of a cardio workout like running, ellipticalling, or biking that I could do for an hour or so. It can be—Hannah says she sees some folks going on their for 30 to 40 minutes—but I really don’t know how those people last that long. I’m not even talking about how exhausted they must be; I’m talking about how bored they must get. As a cooldown, I tried to go on for 10 minutes. At seven minutes, I was just getting into the zone when a Justin Bieber Christmas song came on the “Starships by Nicki Minaj” Pandora Station. (I’m considering filing an official complaint.) Since the Ladder requires the use of your hands, I had to get off the machine in order to change the song. Also of note: magazine or Kindle reading and television watching are near impossible during this workout. Because it’s so important to keep your eyes on the rungs to make sure that you don’t miss one, you can’t read or watch TV or people-watch (guilty!) while working out, so an excellent playlist and some serious discipline are necessary. Despite the Bieber mishap, I found the Jacobs Ladder to be a pleasant surprise. It worked muscles that I don’t normally work when I’m running or ellipticalling. It was empowering to train with my own body weight rather than using hand weights or a barbell to get the job done. You can bet I’ll be incorporating it into some circuit workouts when I get back to school later this month. Just don’t expect to see me climbing on that thing for 40 minutes—it’s so not happening. >> Any Sporting Club member is welcome to use their Jacobs Ladders. 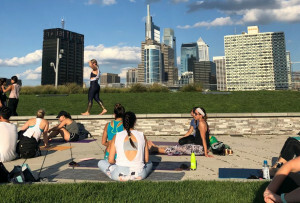 Do you know of any other Ladder locations in Philly? Would you ever give this workout a shot? Let me know in the comments! And check out more posts in our I Tried It series.